Three PBI crew members got a good look at the ugly weather that swept through the South in April. Panel Built Installers John, David and Noah had a close call during the recent outbreak of killer tornadoes. They were in Atoka, OK working on a project at the local recycling plant. From their hotel window, they watched as the weather came through, and saw three tornadoes approach and touch down. 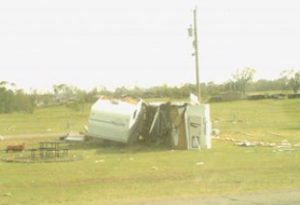 The crew was in Atoka for 9 days, and the tornadoes came through midway during the install. 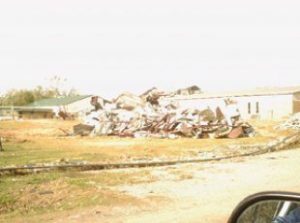 “We almost lost the building we were working in,” said John, “if one of the tornadoes had stayed on the side of the mountain the hotel was on, it would have taken our project out.” Instead, it went to the other side and took out a whole community. 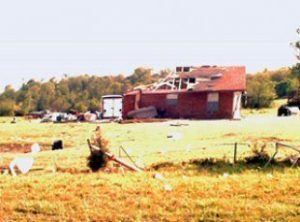 There were four tornadoes that hit the area, and one of them was classified as an F3, which packed winds of up to 206 mph, along with baseball to grapefruit sized hail. The Panel Built truck suffered a few dents in the hood, but thankfully the crew stayed safe. There were two deaths in the town and hundreds of injuries, but there wasn’t a lot the crew could do. “We would have helped, but they wouldn’t allow us down there. They had everything closed off except for emergency vehicles.” The crew made it back in one piece, and shared these pictures. Our thoughts and prayers go out to all of the victims of these tornadoes.